There’s something about a fire – it just naturally draws people in. If you’ve got a fireplace in your home, you know what we mean. Folks just love to gather around a crackling fire, and it provides a relaxed atmosphere. 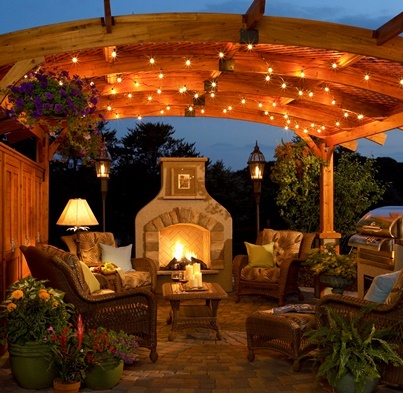 But don’t just limit that to indoors – installing a fireplace, fire pit, or free-standing fire feature as a part of your landscape means you can bring that same ambiance to your yard as well. While indoor fireplaces get used only in the colder months, outdoor fire areas can be used all year long. In fact, with a fireplace in your yard you’ll probably find yourself spending more time outdoors in colder weather. Fireplaces and other fire elements just naturally provide an intimate feel, even in a wide-open space. They become inviting focal points for your yard, and they just seem to facilitate conversation. Adding a fire element to your landscape can take many forms, and it can be designed to fit in with your already-existing landscape and your home’s design, or you can opt for a new landscape design which showcases your outdoor fire spot. And no yard is too small. Even if you don’t have the room for a full-fledged fireplace, we offer custom-designed pieces furniture which incorporate fire. 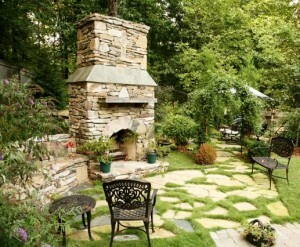 One of the hottest new trends in landscaping is to add a fire area next to a pool or spa. You’ll find you and your guests will make more use of the water on cooler days when it’s available to take off the chill at a poolside fire. 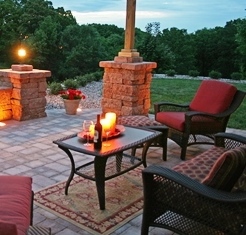 And last but not least, outdoor fires provide unique cooking and entertaining options. Bring your meals outdoors and make them casual. You might be surprised how much fun your friends and family might have roasting their own skewers over a tabletop fire, or even cooking the traditional brats or hot dogs over a fire pit. Fireplaces can be fitted with spits and pot hooks to make them usable for cooking as well. There’s something about fire-cooked meals outdoors that just can’t be matched with indoor eating.